Easy & Free to Import MSG files to Outlook PST for Outlook 2019, 2016,2013! Safe software to Convert MSG to PST file. Are you searching for handy solution for MSG Converter to PST Outlook Software? 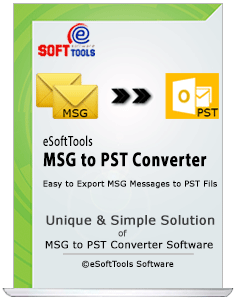 Now take a look on eSoftTools MSG to PST Export software which helps to combine unlimited MSG file to PST file within minutes. The conversion of MSG to PST is fully automated. MSG 2 PST software requires only your collection of MSG file folder and after itself convert all MSG files to PST file. During the conversion of MSG 2 PST file, software exports every email properties (To, Cc, Bcc, Subject, Date & Time). Preview facility gives you clearity of MSG file recovery and then convert msg to pst file. MSG file attachments, email body and embedded data successfully convert into PST file. The resultant Outlook PST file is fully Unicode PST file which open by all versions of MS Outlook including Outlook 2019. 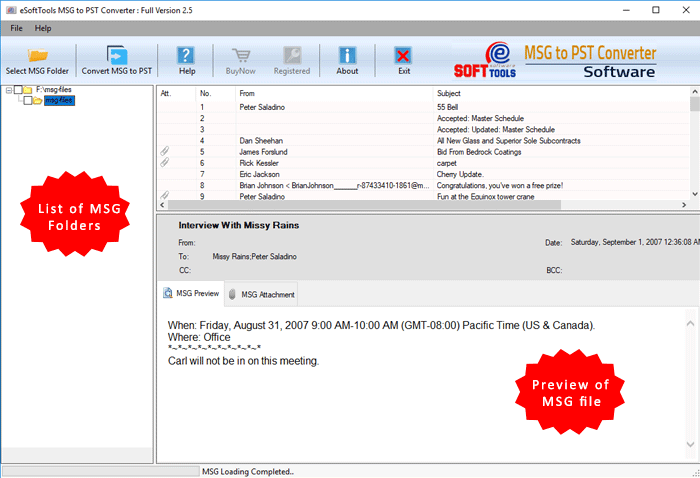 Demo version: The trail version of MSG 2 PST tool allowed to convert 25 MSG files to PST. MSG to PST Conversion software designed to help users to convert bulk MSG files/ folders into PST file for MS Outlook platform. In this MSG 2 PST converter software, users can easy to get preview of all MSG files before going to convert it. The converted Outlook PST file always be in Unicode format that will easily open by any version of MS Outlook including Outlook 2019, 2016 and all below version. 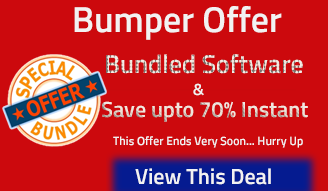 MSG to PST Converter tool is 100% risk-free software for MS Outlook users. Software convert msg files with all message attachments, contacts, calendar items to PST file and also maintains original folder structure. MSG file to PST converter software have batch conversion facility, so you can export "N" number of email MSG messages to Outlook Account PST at a time by "Select MSG Folder" button. The software is specially designed with advanced techniques that lead the users to import all email details of MSG files into PST account without missing single details of MSG files. So you would be easily able to import MSG to PST with all header information including to, cc and bcc, sent & received date, attachments and embedded images & many more. Import MSG 2 PST software itself create New Outlook PST file which supported by all versions of MS Outlook including MS Outlook 2019, 2016, 2013, 2010, 2007, 2003 & 2000. User can self choose the location of created new PST file. Able to convert MSG email files with complete elements - Meta data (to, cc, bcc, from, date / time), Formatting (style, fonts, image, signatures, hyperlinks) & more. Know more how to use MSG to PST software? MSG 2 PST tool has an intuitive UI based on a multi-step wizard, which is easy enough to be used by people with zero experience and basic PC skills. Learch and see easy steps to convert bulk msg files to pst outlook file. The demo version of MSG 2 PST file software available free to download and convert msg files. The demo software allowed to convert only 25 msg files to pst. Trail version limitations auto removed from software but once you applied the valid license. How to use and convert MSG to PST file? Click on "Convert MSG to PST" button and import MSG to PST file. Is MS Outlook required for conversion? Is bulk MSG to PST conversion possible? Yes, this software exactly work on the concept to handle bulk msg conversion to pst file. What does demo version do? 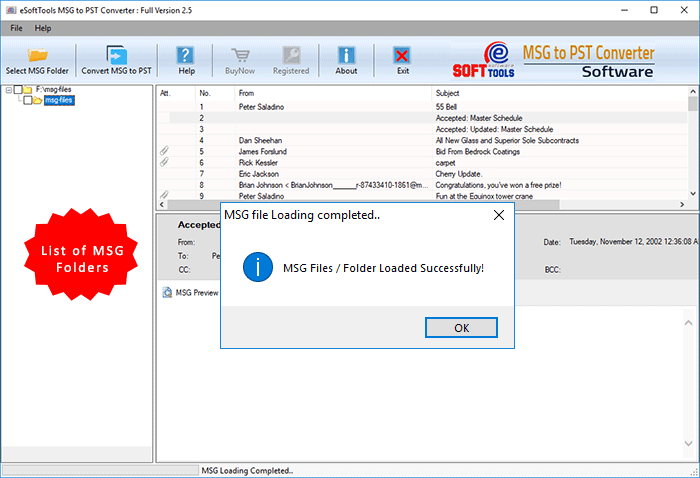 The demo version of free MSG 2 PST tool, allowed to convert 25 MSG file to PST file. Can i convert MSG contacts to PST file? Yes.. This software will accept all types of MSG files including MSG email messages, MSG Contacts, MSG Contacts, MSG Tasks, MSG Journals and convert into PST file. Is the converted PST file is Unicode? I used MSG to PST tool on over 15K+ MSG files and its processed to import MSG files to Outlook 2016 successfully. Single mouse click really impressed and the design of software is very simple to use. Thank you a lot..